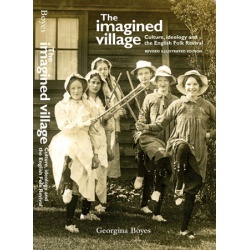 Georgina Boyes' award-winning book, The Imagined Village: Culture, Ideology and the English Folk Revival was published in a new, illustrated edition in August 2010. Out of print for several years, this comprehensive examination charts the emergence of the Folk Revival movement in England through the determined proselytising of Cecil Sharp and the development of organisations to encourage performance from the Esperance Guild and English Folk Dance Society to the emergence of Folk Clubs, mummers' teams and Folk Festivals. Alongside this, however, runs the analysis that 'The Folk' themselves were a convenient fiction. They and their culture were created and used in the cause of conflicting ideologies - including the Women's Suffrage movement and British Fascism. Issues of Englishness, class and creativity are all dealt with in this fascinating and controversial history of the Folk, who existed only to sing and dance in an Imagined Village. The Imagined Village won the Katharine Briggs Folklore Award and was later the inspiration for Simon Emmerson's musical experiments of the same name, featuring Martin and Eliza Carthy, Chris Wood, Billy Bragg and others.